Shamrock Shufflers could be in for a cool and soggy run Sunday. Clouds will move in to the Chicago area early Sunday morning after a sunny Saturday. There will be a chance for rain when the race kicks off at 8:30 a.m., and the possibility for showers will increase throughout the morning and early afternoon. The temperature for race day is expected to be below the average, although it will be warmer than Saturday. The high for Sunday is 45 degrees, which is about 7 degrees below the average for this time of year. Saturday's temperatures will be cooler, with a high of only 36 degrees, despite the sunshine. The March cold snap is expected to break early next week. By Monday, highs will be in the 50s and low 60s again with a chance for rain on Monday, Tuesday and Thursday. 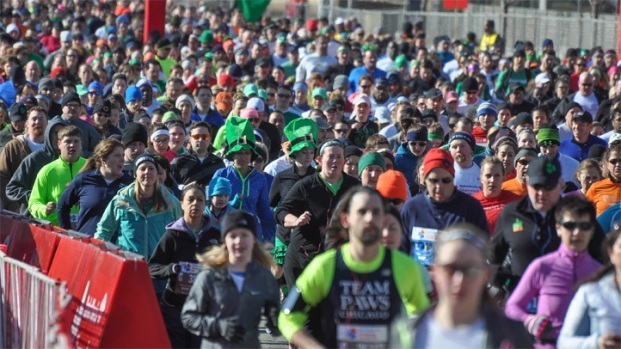 In the past, the weather for the Shamrock Shuffle varied from the frigid and snowy to the hot and humid. In 2009, runners finished the 8K course in the snow and slush. Just two years later, they suffered through temperatures in the mid-80s.